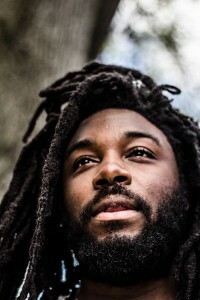 Despite complaints from a contingent of parents about a photo of a gun on the cover, the New York City Department of Education has no plans to remove Jason Reynolds's YA novel from lists of suggested reading material for seventh and eighth graders. 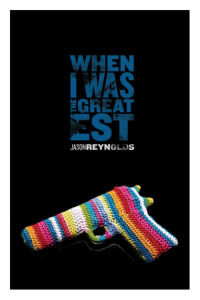 New York parents are objecting to Jason Reynolds' When I Was The Greatest (S. & S., 2014)—specifically the cover, which depicts a gun covered in rainbow-colored yarn. Although not required curriculum, the novel came to the attention of Brooklyn middle school parents because of its inclusion on suggested reading lists distributed by the New York City Department of Education (DOE) to public schools and libraries encouraging parents to read with their children. Reynolds, who earned a Coretta Scott King award for the book in 2015, and also picked up Coretta Scott King honors for his titles The Boy In The Black Suit (S. & S., 2015) and All American Boys (S. & S. 2015) co-authored with Brendan Kiely, says neither the DOE nor parents reached out to him about these particular concerns. However, he acknowledges that "push back on the cover has been going on since [the book] came out." "They see a stark image of a gun, and they think I am perpetuating gun violence," says Reynolds. "The image is really what makes people uncomfortable. But in reality they have never read a page." When I Was The Greatest follows the story of three teens growing up in Bedford-Stuyvesant, Brooklyn. The idea for the cover came from Reynolds' editor, he says, who had noticed yarn bombings around Scandinavia— where public objects from trees to bikes are covered with yarn. The street art, often compared to a form of graffiti, happens world wide. Reynolds, a Brooklyn resident since 2005, happens to be "into yarn work and crocheting," he says. And the idea immediately resonated with him. But parents, he says, have reached out to him in the past, saying they don't understand why he would put a gun, to them a symbol of violence, on the book. And he's heard of the book being wrapped in plain paper with the title written over and even the covers being torn off before it's read or placed in schools. "In my mind I see the cover as yin and yang, that everything in our lives has a balance between hard and soft," he says. "Young readers love the book, and I have not heard from a young reader who has had issue with the book," he says. Complaints have not been raised outside of this particular school, says a DOE spokesperson, who would not name the campus. Reynolds himself was not familiar with the name of the school either, but did post on Instagram about the complaint when he heard about it on the news on January 6. However, the title is included in material distributed by DOE's NYC Reads 365 program, which launched in 2015. From posters to bookmarks, the project encourages the city's K–12 students to read everyday—publishing reading lists for each grade. Reynolds' book is one of 20 named on the DOE's joint Recommended Reading List for 7th and 8th graders, and the DOE has no plans to remove the title from the list, says Will Mantell, DOE Spokesperson. "While this book is on a list encouraging daily reading for pleasure and is not mandated, it is an age-appropriate and engaging story, and we are confident students will understand and appreciate its message of nonviolence," he says in a statement.